For Pakistan, this was supposed to be the future after Misbah-ul-Haq and Younis Khan. It is a future that arrived a little late, taking a toll on their Test match form in the process, but at the hour of reckoning, their purported replacements, Azhar Ali and Asad Shafiq, put Pakistan within touching distance of a 1-0 lead in the three-match series. Coming together with Pakistan on 48 for three, somehow looking they’d contrive to lose a match they were on top in, they sucked the life out of New Zealand’s hopes. An 82-run partnership as the players headed in for lunch put Pakistan just 46 runs away from a win, with six wickets in hand. Pakistan were virtually home and dry till the last over of the session, but Wagner got Shafiq to nick one behind to the wicketkeeper, and on a track where it is notoriously hard to settle in, this match is still up for grabs. 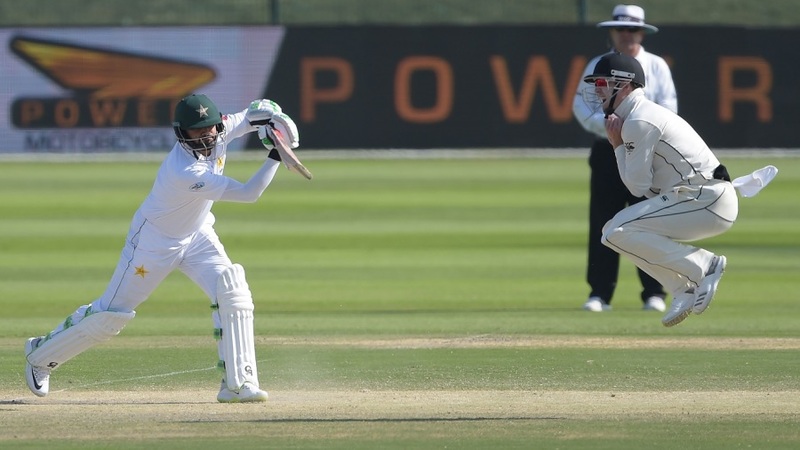 Pakistan have had trouble chasing down low totals in fourth innings recently. Last year in Barbados, they were shot out for 81 in a chase of 187, while here at this very ground, 13 months ago, Sri Lanka bowled them out for 114 to deny them a seemingly certain win by 21 runs. So when they lost three wickets in nine balls this morning, another crash and burn looked very much on the cards. Ajaz Patel triggered it with a lovely delivery that came back in and hit the pads quicker than Imam-ul-Haq could cope with, before Ish Sodhi made his impact on the game. A flighted delivery beat Mohammad Hafeez in the air leaving him spooning a catch to short cover, while Haris Sohail – just like in the first innings, drove a low full toss back towards the bowler. Sodhi completed a brilliant, low catch, and the famed Pakistan implosion never far away from the surface came bubbling to the fore once more. But then, Azhar and Shafiq joined hands. Not the Azhar Ali of late, the uncertain, hard hands imposter that has dented his reputation in the past year, but the real thing. He was never rash, but insisted on keeping the runs flowing, eager to play the supporting role to Shafiq, who looked so free from the pressure you wondered if he really understood the importance of the situation. Sodhi, who had been looking to rip through the Pakistan line-up as spinners do on surfaces like these, suddenly lost his rhythm and couldn’t pitch two consecutive deliveries in the same postcode, while the spin Patel began with was nowhere to be seen. Once the partnership got through the first 20 runs or so, Pakistan inexorably looked on their way. There were no chances offered, no cause for the fielders to be excited, no spin, swing or bounce. Even Trent Boult looked out of ideas, and as New Zealand do in these situations, they turned to Neil Wagner. Azhar played his short ball particularly well, keeping his pull shots down and getting runs on the leg side, and it appeared New Zealand had no more cards left to play. That was until Shafiq poked at a wider delivery from Wagner in the last over before lunch, giving New Zealand another flicker of hope. It may just be a flicker, after all, but with Pakistan’s recent history, no supporters will be taking anything for granted just yet.